The Global Citizen Honors Program (GCHP) at Olivet College is designed for the student who wishes to continue demonstrating creativity and leadership within the framework of Individual and Social Responsibility. Invited members of GCHP are provided opportunities to investigate global, interdisciplinary issues by inquiring into the theories and philosophical underpinnings of complex social issues. As a required residential student living on campus, you will have the opportunity to fully immerse yourself in the campus community. The program is experiential, requiring members to be involved not only with the problems they are investigating but with each other and the world around them. In addition to competing for a full-tuition scholarship, GCHP members are offered a distinct academic experience, including honors seminar, honors option courses, honors sections of Liberal Arts Core courses, world languages and the Oxford Experience. There are also a host of co-curricular events and opportunities that, taken as a whole, provide a comprehensive academic experience for our members. Members who complete the GCHP requirements will receive official recognition, including language and/or insignia on their diploma, transcript and commencement program designating them as a graduate of the GCHP. 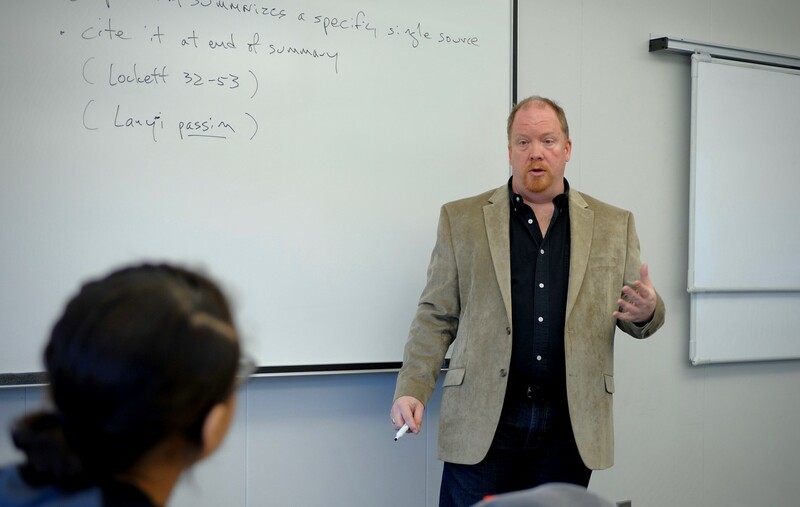 For more information about becoming a member of GCHP and the academic requirements for participation, please contact Kirk Hendershott-Kraetzer, Ph.D., GCHP director and professor of english, at 269.749.7621 or via email at kkraetzer@olivetcollege.edu. Each year, students can compete for various scholarship awards – including a full tuition scholarship – through an essay contest. For more information about the GCHP Scholarship Program, please contact your admissions representative at 800.456.7189 or admissions@olivetcollege.edu. Members of the Global Citizen Honors Program (GCHP) have a number of benefits available to them once they begin the program. Priority registration. All GCHP members can register for classes as soon as registration opens, helping to ensure access to high-demand courses they need to complete their degree or are interested in taking for their personal enrichment. GCHP-members-only courses. The GCHP offers two types of courses that are open only to program members: honors sections and honors seminars. Honors sections are courses that have been designed specifically with GCHP members in mind, with assignments crafted to challenge program members intellectually and creatively. Currently, the program offers honors sections for Writing and Rhetoric I, Writing and Rhetoric II, Civilization Studies, and General Chemistry Laboratory. The courses appear on the student transcript as honors sections. Honors seminars are 3-credit-hour interdisciplinary courses. Limited to small enrollments, multiple honors seminars are offered each semester. Coursework is often non-traditional, and topics regularly rotate. Topics of recent honors seminar offerings include fairy tales, graphic novels and social disruption, Hamilton, and ecstatic tragedy. Enhanced regularly-offered courses. Completing an “honors option” in a regularly-scheduled course gives program members the opportunity to work on-on-one with college faculty on projects that extend and enhance courses they would take as part of their liberal arts core or major-minor requirements. Frequently, program faculty custom-design honors options based on individual students’ interests and needs. The honors thesis. In their senior year, GCHP members apply for and complete a 3-6 credit hour honors thesis under the supervision of a professor of the student’s choosing. This is an opportunity for students to engage in intensive, independent, in-depth research in a subject of their choosing, working one-on-one with their professor. Program offices. The GCHP office provides students with space for individual and group study, a dedicated work station for checking email and printing assignments, a lounge area for reading, conversation, playing board games, working on puzzles, or just taking time to relax in the middle of the day, and a growing lending library. The Oxford Study Abroad Programme (OSAP). In coordination with OSAP’s Oxford offices, the GCHP offers program members the chance to spend part of their summer studying at Oxford University in the UK, earning up to 6 college credits in the process. While this program is a significant extra expense, students who have participated in the program have found it to be a transformative experience. For more information about the Oxford Experience, click here. Program events throughout the year. The GCHP hosts a variety of events for its members, including a fall welcome picnic and field trips to local destinations and to larger cultural centers. Two membership “levels.” All students who accept the invitation to become an honors student enter the GCHP program as GCHP Scholars. GCHP Scholars are individuals who are committed to completing the 24 honors credits, including the honors thesis, and intend to graduate from the honors program. However, the program faculty recognize that our students’ lives are complex, so we offer students the ability to “step back” to the GCHP Associate level of participation as early as the first semester of study. GCHP Associates are required to meet a portion of program expectations in order to retain their GCHP scholarship and retain all the privileges of the program, but they are not required to complete all 24 honors credits or the honors thesis and so cannot be recognized with GCHP honors upon graduation. To become a program associate, a GCHP Scholar consults with the GCHP program director and completes a petition to move to associate status. He or she may move back to GCHP Scholar status at any time, in consultation with the program director. Members are in charge of their own learning. The GCHP is designed to place members in the driver’s seat – they decide whether they are ready to commit to remaining GCHP scholars or whether they would prefer a less rigorous but still engaged experience as an associate member. Members decide whether to pursue and complete honors options and whether to take honors sections or honors seminars. The program director and program faculty are always available for advising and consultation, but the goal is always to empower the students to push themselves, to seek out opportunities to grow. Honors upon graduation. GCHP Scholars who have completed all program requirements may elect to wear a special stole at commencement indicating their status as a graduate of the Global Citizen Honors Program. Honors program completers also receive special insignia on their diploma indicating that they are a graduate of the honors program.